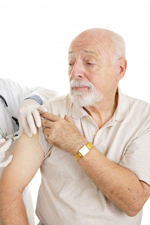 Time to have your flu vaccination at the Practice! Free Flu vaccinations are available at the practice for those over 65, young children, pregnant women and adults & children with long-term health conditions - you can book an appointment! Or ask for a flu vaccination when you attend for another appointment - we may be able to do this while you are already here to save an extra journey!